At his Houston cosmetic dentistry practice, Dr. Wayde Fawcett and the rest of the team strive to adhere to the highest stands of patient care. With that in mind, Dr. Fawcett wanted to reconstruct a new website design for his practice to better showcase his dedication to his patients. Through partnership with Rosemont Media, Dr. Fawcett and his team at the Fawcett Center for Dentistry formulated a customized, state-of-the-art dental website design to enhance users’ online experience and provide adequate, reliable information. The new website contains an aesthetically pleasing and eye-catching design that integrates detailed tabs with doctor biographies, practice information, dental procedures and more. Dr. Fawcett says patients are able to easily find information with the easy-to-use, dynamic design. The Houston dentist adds that the new site better facilitates doctor-patient relationships and enables patients to connect with the practice through a variety of methods. Some of the procedures offered at Dr. Fawcett’s practice include smile makeovers, teeth whitening, TMJ treatment and porcelain veneers. Rosemont Media’s team of SEO writers, graphic designers and developers collaborated with the practice to optimize the website content for search engines and integrate the most advanced marketing strategies. By doing this, Dr. Fawcett says he is able to reach out to more potential patients and further display his commitment to patient care. 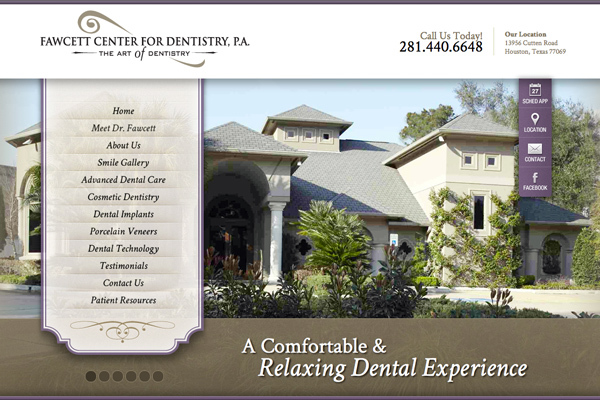 For an in-depth look at the customized website design Rosemont Media can create for your practice, please visit drfawcett.com.